I must admit I had no idea what was going on here when I drove past this scene in Kansas a few weeks ago. 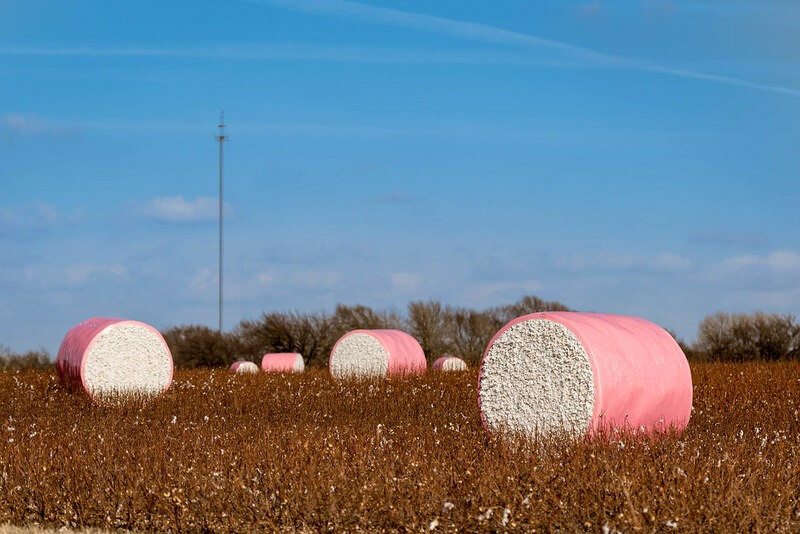 I’ve spent pretty much my whole life in the midwest but I had never before seen giant bales of cotton wrapped up in bright pink, and the sight was almost otherworldly. But there I was, driving down Highway 77 southbound towards Oklahoma when just to the east I spotted a field dotted with these bulbous pink cylinders and I didn’t have a clue what to make of it. All I knew is it would probably make an interesting picture, so I turned off onto the shoulder, got out my camera, and set to work. I had my Fuji X100F and my Nikon D750 + 70-200 f/2.8 with me, and I knew right away I would need the latter and not the former to get any type of decent shot. I’m not one to go around trespassing on random fields, and because I knew I wanted to fill the frame with the giant reddish weirdness that was one of these bales I figured my best option would be to use the zoom lens, which turned out to work pretty well. It’s sometimes tricky to judge things like depth of field on a small camera screen but I was pretty sure I wanted to use f/2.8 since I was really hoping to put one single bale in focus with the rest slightly blurry, and anything smaller than f/2.8 wouldn’t have really given me the background blur I was aiming for. I was just hoping it wouldn’t be too much blur, but in the end any fears of such proved to be unfounded. The one thing that I was really going for was to have each bale in the shot exist in its own space within the composition–a lesson I learned from Sam Abell in his remarkable lecture The Life of a Photograph. (Skip ahead to about the 47-minute mark if you want, but really the whole talk is worth your time.) Much like Mr. Abell did in his shot of calves being branded I wanted each bale to be separate from all the rest but all work together to form a cohesive whole, so I scooted left and right until I was satisfied I got the composition I was aiming for. I wasn’t quite sure what to do with the radio tower in the background but I figured there was really nothing I could do, so I just didn’t think about it too much. When I was a kid, I grew up on tales of the Salt Creek Creature, Bloody Mary, and Pigman. One night twenty years after camping out in the haunted wonderland of the Woods, I made a trip back there with four of my hard-core delinquents from Havelock. They were between the ages of 13 and 15, and they had not spent one day in school for the past 6 months. As their truancy tracker, I made them a deal. If they promised to stay in school for three weeks straight, I would take them on an adventure out to the Woods near Bloody Mary’s place. Toby was 15 and Jeffy, his little brother was 13. Both had been placed on probation for truancy. One of their most notorious crimes had been the night they tipped over a pop machine to steal money and pop from it. Unfortunately, the heavy pop machine had fallen directly on Toby’s foot and broke his ankle. He had to be carried away, even as sirens wailed in the distance. Lucky me, in my role as a truancy tracker and family support worker, the two brothers were assigned to me through the court. Two of my other kids I worked with Justin and Bruce were both 14, and they were on probation for truancy, as well. Both were friends with Toby and Jeff, and the four of them didn’t even flinch when I told them stories about what would happen to them if they ever ended up in Kearney. So I did not think these four were afraid of anything. Until the night I took them out to the Woods. Slowly, the four kids climbed out of my van. They then followed me down the slope to the Woods. About halfway there, I stopped and bent down, pretending to tie my shoe. All of the boys walked on past me, reaching the bottom of the 30 foot slope and looking up at the Woods above us. The moment they did, a tall, dark figure rose up out of the tree line at the edge of the Woods. A second later, one of those huge, round hay bales came rolling down the slope toward us. Toby, Justin, Bruce and Jeffy screamed like girls and spun around to avoid getting smashed by the huge hay bale. They plowed into me, knocking me down, and ran to get back up the slope to the van. I swear, Toby ran directly over me, because later I had a huge dirt footprint on the front of my T-shirt, where his tennies had trampled over me. The four boys clambered into my van, locked all the doors, and peered out the windows like wide-eyed barn owls. I still lay sprawled at the bottom of the hill as two dark figures stepped out of the Woods and started down the hill toward me. For you see, my two friends, Tom Bretta and Jack Davis had drove out there to the Woods earlier that night to set up the prank. By the time they reached me, trampled and dazed from being run over, Tom and Jack were laughing hysterically. The four boys took some convincing that we had set this up earlier. They finally unlocked the van and climbed out to shake the hands of Tom and Jack for pulling off such a terrific prank. Unlike most of my stories I post, I change the names of characters so that they remain anonymous, but in this case, that prank was so damned good, I used the real names of those involved. Any of you who know them, ask them about that night in case I left out any details. And like Toby said, it was a night I’ll remember forever. Tom…you are such a good storyteller! I was laughing out loud as I read about the prank you pulled, and I can clearly see you pulling it off–psyching the kids up beforehand, bending down to tie your shoe, waiting for the hay bale to come crashing down, and the boys screaming like little kids as they ran away :) You’re awesome, dude.